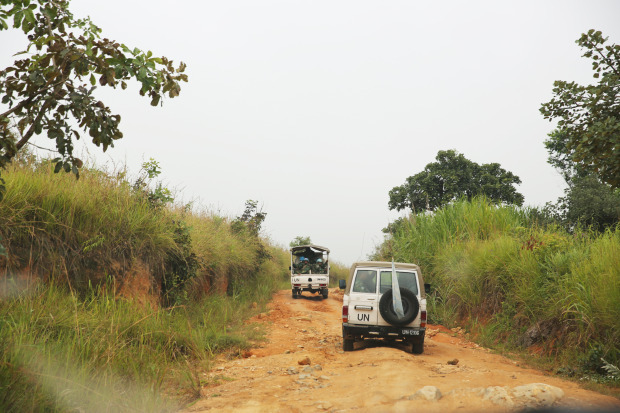 Congo’s rural infrastructure, including roads, desperately needs more investment. One way to achieve this would be through locally-controlled Provincial Development Funds. The redistribution of mineral revenues between the Democratic Republic of Congo’s (DRC) central government and provinces is one issue currently dominating political debate in the country. On the 19th May 2014, President Kabila’s Chief of Staff wrote to the Prime Minister asking that the government instruct relevant services to fully implement the article 242 of the DRC’s constitution. This article states that the central government has to retrocede 40 percent of mineral royalties to provinces. No such retrocession currently takes place. In mid-February 2015 civil society groups in the Haut-Uele district of Orientale Province called on the district’s business community and all taxpayers to engage in fiscal disobedience and stop paying taxes to the central government. The reason for such a call was simple: to protest against the government’s failure to fulfill its promises to rebuild the district’s roads. The letter sent by the President’s Chief of Staff to the Prime Minister, as well as the call for fiscal disobedience made by civil society in the Haut-Uele district, are only a reflection of a deep and growing frustration within many Congolese provinces, especially those wherein mining is exploited by foreign companies. The frustration stems from an antiquated and ill-conceived governance system that is not conducive to socio-economic development. At the root of the problem is the lack of commitment to the mining code, which states that 40 percent of collected mining royalties should be retroceded to provinces. This retrocession system does not work because the central government, which lives off of taxes (largely from mining and customs), has neither the political will nor an incentive to do so. As a consequence, mineral taxes and royalties only serve the interest of Kinshasa and its corrupt elites at the expense of the provinces. The non-retrocession of mineral revenues to provinces can be explained on the grounds of a culture of rent-seeking that characterizes many rulers in mineral-dependent economies like the DRC. It is no secret that over decades Congo’s rulers have behaved like the economist Mancur Olson’s “˜Roving Bandit’ who, because of his lack of interest with citizens, has a very short-time horizon and thereby discounts the future by maximizing his immediate interests at the expanse of the longer-term interests of the society. In the end, the Roving Bandit has no incentives at all to invest society’s resources in the improvement of the material conditions of the citizenry. If the Congolese elites were at all concerned about improving the living conditions of the poor, then they would rethink a new and effective system of governance. By this I mean a real fiscal, administrative and politically decentralised system with the potential to unleash the country’s energy for development. The DRC is too big to be managed from a woefully inadequate centralized system. The upcoming elections should give Congolese a window of opportunity in which to engage in a national dialogue for political and economic reforms that will benefit the majority of citizenry. It is politically irresponsible, morally reprehensible, and economically inefficient for provinces to send mineral revenues to the central government in Kinshasa and wait for this to retrocede 40 percent of that money. Without strong incentives, the government and the regime’s cronies will continue to enjoy all the benefits from the Congo’s riches with little concern for the provinces and their residents. The call from Haut-Uele civil society has motivated me to write this essay with the goal of stimulating a debate among my fellow Congolese on the question of fairness in the sharing of fiscal revenues. My proposition may seem unattractive to some people, but can serve as a basis for such a debate. What I am advocating for? We need to create institutions in the DRC that I will call “˜Provincial Development Funds.’ Each province should have one and the central government will cease to be the master in the decision-making process of how development revenue is spent. Although the constitution currently states that Congo has a “˜decentralised’ system, this is an empty statement. It is very obvious that the central government politically and economically holds back provinces by undermining their financial capacity. It is time to stop the central government in Kinshasa from continuing to kick away provinces’ ladders of development. With respect to mineral revenues, the following simple questions must be answered. How do people in Namoya (in Maniema province) hold the ministry of health responsible for the lack of medicine in a local health center, despite all the mineral taxes paid by a mining company operating in that zone? Why is it that the provincial government in Katanga must wait for Kinshasa to retrocede 40 percent of mineral taxes so that it can finance its provincial development projects? The mandate of “˜Provincial Development Funds’ I am proposing would be to finance targeted pro-poor policies to meet the needs of present and future generations at local and provincial levels. For example, the proposed funds could finance public investments such as rural infrastructure, primary education, health centers, or other public works projects. The proposed Provincial Development Funds could be funded by a certain earmarked percentage from mineral revenues. The Mining Code’s provision pertaining to the retrocession of 40 percent of mining royalties to the provinces (out of which 25 percent should go to provincial administrations and 15 percent to territories where mining activities are being conducted) is good, but incomplete in my opinion, because there is no prior indication of what the money should be used for. There is thereby enough room for resource diversion away from development needs. For instance, provincial authorities might simply allocate money to cover administrative expenditures at the expense of pro-poor initiatives. This problem may be addressed by constitutionally earmarking a portion of mining royalties to Provincial Development Funds. Moreover, the proposed funds should be managed based on certain democratic principles. First, the constitution would mandate the creation of such funds so as to facilitate the development process at provincial levels. Second, provincial legislative assemblies would approve eligible programs to the funds, after consultations with local communities. Third, the legislative assemblies would authorize any disbursement of money from the funds. A project or program that does not receive the approval of the provincial assembly should not be funded at all. These principles are crucial for the sake of transparency, accountability and social cohesion. Two elements are worth pointing out. First, we should be reminded that a culture of corruption and rent seeking are prevalent at all levels of Congolese society. Earmarking a certain proportion of mineral revenues to the Provincial Development Funds can serve as a public buffer against provincial elites’ rent-seeking behaviour. Second, given the problem of ethnic diversity facing the Congolese society, provincial assemblies are crucial under the proposed scheme because they are representative of all ethnic groups. Under this circumstance, the only way to avoid favouring a certain ethnic group or tribe is through a voting process within the provincial assemblies. The proposed scheme of Provincial Development Funds presents numerous benefits in relation to the social and economic development process. First, it gives local authorities and communities more political and economic leverage in relation to development. Second, it enhances the prospects of democratic accountability and transparency. Third, it enables not only present but future generations as well to benefit from mineral revenues collected at the present time. Benefits from investment in roads, bridges, or health centers have a tremendous potential to last longer and meet the needs of future generations as well. I anticipate that opponents to my proposal would argue, among other things, that provinces lack capacity to manage a massive influx of revenues. This line of reasoning is misleading. While it may be true that provinces’ absorptive capacities might be weak, it is equally true that those capacities must be strengthened. There are people all over Congo’s provinces who have the capacity to manage money and who have a clear understanding of their development needs. The problem of absorptive capacity is simple to solve: people respond to incentives. To those who argue that my proposal is unrealistic, my rebuttal is that we must discuss the most efficient way of making Congolese people benefit from the country’s mineral wealth, not only the elites. My proposal has the potential to serve as a ground for a true and constructive discussion for development. For example, those, like me, who attended schools built, funded, and managed by missionaries in rural areas, should be quick to realize that if those western citizens had not dared to build those schools, many of us would very likely be illiterate. The proof is simple: most of the schools many of us attended in rural areas are in a decrepit state, resembling those built a century ago. The contribution of the Congolese state in maintaining and modernizing schools in rural zones has been minimal (if not zero). The same thing can be said of the health centers where many of us were born. Let us rethink a new way of improving the living conditions of the majority by making collective interest a priority. The distribution of mineral revenues must be done fairly and the central government must give provinces the money they need. The Provincial Development Funds I am proposing are one good way to use the money generated through mining activities. They have the potential to facilitate the financing of development and the alleviation of poverty at provincial levels. The upcoming elections should be taken as a window of opportunity for such a debate. Decky Kipuka Kabongi is an independent public policy analyst on the DRC (can be reached at dkk4newdrcongo@gmail.com).